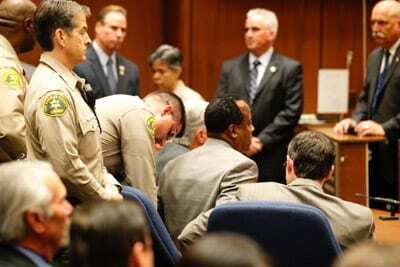 Conrad Murray, Michael Jackson’s former personal physician, was convicted by a Los Angeles County jury on Monday of involuntary manslaughter. After a very public and high-profile trial, the jury found that Murray acted with criminal negligence that was so severe that it played a large role in Jackson’s death in 2009. The defense asserted that Jackson administered the deadly dose of Propofol to himself, therefore Murray was not a factor, but the jury rejected this theory. Jackson’s former doctor was immediately handcuffed upon the decision and will remain in custody until his November 29 sentencing. “This is a crime where the end result was the death of a human being. That factor demands rather dramatically that the public should be protected,” Los Angeles County Superior Court Judge Michael Pastor said, according to the Los Angeles Times. Murray is facing a maximum of four years in prison, and will most likely lose his medical license. Throughout the trial, witnesses accounted that Murray had made many medical mistakes, including giving Propofol in an unmonitored setting, messing up basic resuscitation and not keeping records. According to the Times, experts said these mistakes led directly to the singer’s death. After Jackson stopped breathing and died, Murray continued to talk on the phone, text message and receive emails. He did not call for help for a while and lied to the first responders. These factors, and his admission that he gave the pop-star Propofol were the nail in the coffin for Murray’s case. The publicity around the trial also posed a challenge to the defense. All of the nearly 150 people considered as jurors had heard of the case before the trial.